Sos@anointernet.com is a malicious computer infection classified as ransomware. It means that when the program enters your computer as a Trojan, it holds your computer (or your files, in this case) hostage until you pay a pre-determined ransom fee. Needless to say, it is important to remove Sos@anointernet.com from the system as soon as possible, and the best way to achieve that is to invest in a legitimate computer security application. For any further questions, please leave us a comment below this description and our team will reply as soon as possible. It does not require an extensive analysis to see that Sos@anointernet.com is a direct clone of Fud@india.com. Both ransomware infections have been created by the same criminals who intend to steal your money. You most probably got infected with Sos@anointernet.com when you opened a spam email attachment. However, spam email messages are not the only method of distribution employed by this infection. Our research shows that this ransomware program might also be distributed via exploit kits. Exploit kits are one of the most prevalent web threats, and they can be embedded in various websites that contain vulnerable software (like flash plug-ins). The pre-written exploit code in the exploit kits targets users that are running outdated software applications. Therefore, all of your software should be updated regularly if you want to avoid Sos@anointernet.com and similar malware infections. Nevertheless, if Sos@anointernet.com has already managed to enter your computer, do not panic because that will not help anyone. Judging from the sloppy and awkward English in the message, we can tell that the people behind Sos@anointernet.com are not interested in beating around the bush. They really want you to pay the ransom as soon as possible, and they claim that it is impossible to decrypt your files without their decryption key. However, that might not be exactly the case. 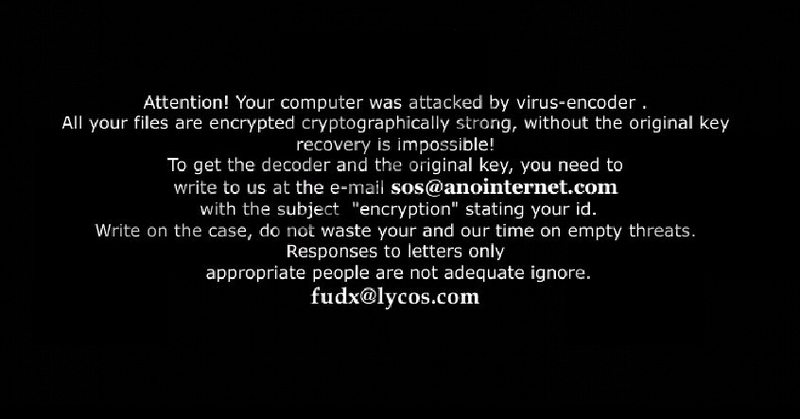 There are several decryption tools out there that can help users infected with Sos@anointernet.com and similar ransomware infections. What’s more, you may not even need a decryption tool if you have a file backup on an external storage device. Either way, you should still consider acquiring a reliable computer security tool that would delete Sos@anointernet.com and all the related files at once, and you would be able to protect your PC from harm. Don’t forget that there might be more dangerous programs running on your system, so you should remove them all as well. Quick & tested solution for Sos@anointernet.com removal.